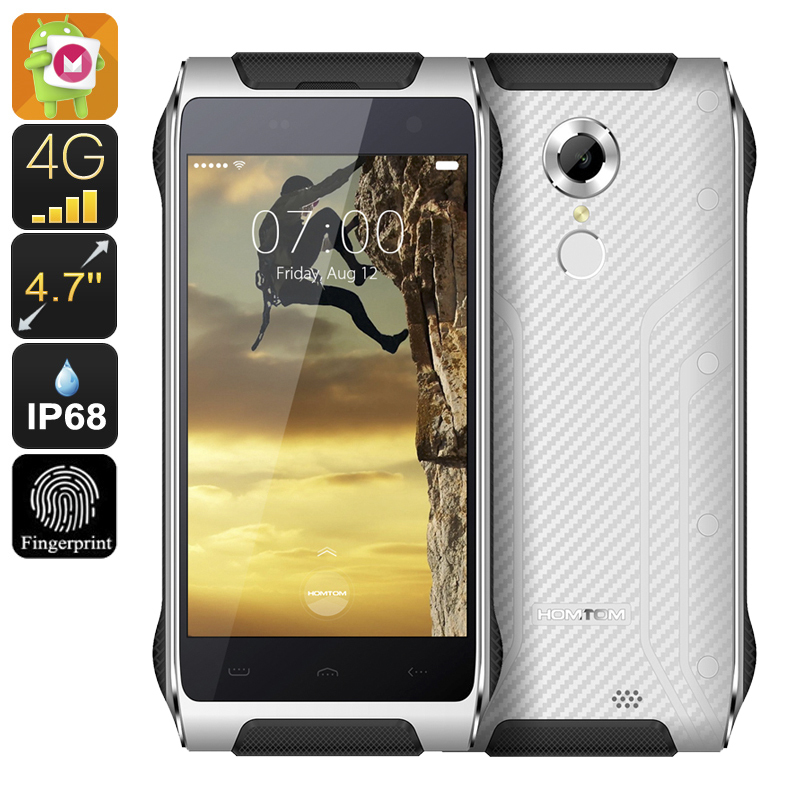 Successfully Added HK Warehouse HOMTOM HT20 Waterproof Smartphone - IP68, Android 6.0, 4G, Quad Core CPU, 720P Screen, Fingerprint Scanner to your Shopping Cart. The HOMTOM HT20 is an unassuming and discreet rugged phone but make no mistakes, with its IP68 rating and rugged build its as tough as they come. Thanks to some cleaver construction techniques that hermetically sealed the phones is able to have an impressive waterproof and dustproof protection without the need for a thick rubber coating and therefore remains understated and elegant Smartphone. Under the hood the phone draws its performance from an MTK67837 CPU clocked a 1.3GHz and has 2GB of RAM so it brings fast processing capabilities able to keep pace with the demands of games and media streaming. At 4.7 Inches the HD display brings a sharp, crisp picture and is perfect for one handed use. A rear fingerprint scanner means you can do away with passwords while ensuring tight security for all your data and contacts. Each of the two SIM car slots on the HT20 Smartphone bring 4G access and this lets you swap between providers with the touch of a button. This functions will be of note to frequent travelers or those planning to holiday overseas as you can enjoy the benefits of multiple providers. For a greater user experience the Android 6.0 operating system has been boosted with smart wake and gesture sensing controls so opening your favorite apps or taking calls on this intuitive phone couldn't be easier. additionally you can enjoy the added benefits of Hot Knot and OTG which allows for fast data transfer between your supported devices. Without a doubt the biggest concern for phone owners is usage time, with the HT20's 3500mAh battery you needed worry as there's up to 8 hours of talk time or a full weekend in standby which should be more than enough for those trips away. The HOMTOM HT20 waterproof smartphone comes with a 12 months warranty, brought to you by the leader in electronic devices as well as wholesale android phones..